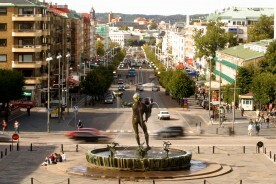 Göteborg is, among other things, known for its avenue (the only in Scandinavia). It starts at “ Götaplatsen”, which is only five minutes walk from Hotel Gothia Towers. Götaplatsen is Göteborgs cultural centre, where the Museum of Art, the Consert Hall and the City Theatre is situated. The Avenue ends at Nordstan and the Göteborg Opera House. In summertime the Avenue and all its restaurants is crowded with people of all ages. The atmosphere is friendly and relaxed, making it at perfect final of an adventurous day. This is partly the reason why a lot of Scandinavian tourists come back to Göteborg year after year. Göteborg is a city of green parks, walking streets and canals. Right in the middle of the city, with the Avenue parade street on one side and the canal on the other is the English park of Trädgårdsföreningen, which contains a large number of beautiful greenhouses. Another park is the extensive Slottsskogen, like an oasis for the Göteborg inhabitants, located at the end of the other main street, Linnégatan. Finally, at the cutting edge of botanical gardens in Northern Europe, there are the Göteborg Botanical Gardens. The whole year around ornamental flowerbeds, exotic trees, a rock garden and over 4,000 different species can be found here. Everyone has heard of the Swedish smorgasbord. Help yourself from a buffet table with a wide selection of dishes. The Swedes usually start with the various types of herring, followed by cold cuts and then the hot dishes. Finish off your meal with cheese, dessert and coffee. But Swedish food is more than just smorgasbord. For about 100 years, the German and French schools dominated Swedish gastronomy. But then something happened! In 1987 a Swedish chef won the Bocuse d`Or - the World Championship in gastronomy, and a new school of Swedish chefs has grown up. These chefs create work with respect for traditional Swedish recipes, while also keeping their eye on Asia, London and California. All these impressions are gathered together and find their expression in “Modern Swedish Food”. Some of the most famous Swedish chefs are to be found in Göteborg, and according to most critics in the trade, Göteborg is the city, which has the most high-class restaurants per capita in the whole of Scandinavia. Three restaurants in Göteborg have stars in the Guide Rouge (former Guide Michelin), Restaurant Sjömagasinet, Restaurant 28+ and Restaurant Fond and the same also recommends several others. Moreover, in the eminent competition SC Swedish Chef of the Year, 7 out of 9 chefs who have won the award over the last ten years have come from Göteborg restaurants! Worth mentioning is that in February 2001, for the first time in history, the event was moved from Stockholm to Göteborg! Also this year the winner of the competition came from a restaurant in Göteborg. One of the reasons why such good food is made in Göteborg is the fantastic raw products available ‘on the doorstep’. The main culinary attraction is the local seafood; prawns, lobsters and a wide selection of fish, ranked amongst the finest in the world. In the cold waters off the Swedish West Coast the fish grow slowly, which make the taste and quality the best there is. The city’s shops are normally open between 9.30 am and 6.00 pm, and until 3.00 pm on weekends. Department stores and shopping centers are usually open longer. Sweden’s largest shopping center, Nordstan, covers an area of 160,000 m2, with a total of 130 shops, four pedestrian streets and a central square. For all permanent non-EU residents there is a VAT refund available on all purchases made in Sweden.